Eat your Fruits & Veggies! So many delicious options! Take advantage of the season and indulge. 4 Tactics for Faster ResultsHave you ever been frustrated over a lack of results from your workout routine? I have good news – the following 4 tactics are guaranteed to crank your workouts up to the next level and to deliver the fast results you want. Easy Slim Down TipDo you want a smaller waist? Try this easy slim down tip: Don’t eat carbohydrates after 4pm. Instead stick with lean protein and green veggies. This will prevent late afternoon and evening snacking and will quickly result in a slimmer waist. Mean & Clean BurritoHere’s a healthy burrito recipe to sink your teeth into. Whole grains, lean protein and crunchy veggies make this a recipe that you’ll come back to time and again. Serve with a side of your favorite salsa. Share this newsletter with your friends. Use the “refer a friend” link below to forward this newsletter to your friends, family and co-workers. As of today, donations for our BEST BUDDIES fundraiser have totaled $3000. WOW! Way to go boot campers. I am amazed at your generosity and LOVE you all! A HUGE thanks to all who have already donated. You are making a positive difference in our world. Please spread the word…we’re ALMOST there. IMPORTANT NEWS!Fit Body Boot Camp is now a “Best Buddy” helping out individuals with intellectual and developmental disorders! Anyone interested in donating to our “Best Buddies” fundraiser….here’s how it works…..
New members – donate $100, get 1 month FREE bootcamp! Members – donate $100, get $50 off your October billing! Everybody who donates will be entered into a drawing for some fun prizes. 1 raffle ticket for every $25 donated. Check out the link to make your tax-deductable donation now! Posted on October 5, 2010 Categories Fitness, Healthy Living, Lifestyle, Training, Uncategorized, Weight LossTags fit body bootcamp - Rancho Santa Margarita, fitness, health, nutritionLeave a comment on Burn More Fat Today! Fill yourself up with a tall glass of water and a yummy apple about 20 minutes prior to eating! You’ll feel full and be healthier! Does it have to be an apple? No, try grapefruit or watermelon. Any fruit will do! Drink This Not ThatChanging what you drink just may be the magic weight loss bullet you’ve been looking for. David Zinczenko and Matt Goulding sure think so. But then they did write the book on it: Drink This Not That. They’ve even gone so far as to claim that you could lose up to 32 pounds in a year just by changing what you drink. What most people don’t know is that it’s a lot easier to drink extra calories than to eat it. So you really need to pay attention to what you’re sipping on. Here is a sampling of what their book has to offer. The following are 5 of the worst things to drink, followed by 5 slimming alternatives. While a cup of hot coffee or a glass of lowfat milk are both great ways to start your day, beware of the smoothie trap. More often than not smoothies are closer to milkshakes than protein shakes. A study done at Virginia Polytechnic Institute showed that people who drink 17oz of water before sitting down for a meal ended up eating 9 percent fewer calories. Those calories can really add up over time. When the afternoon rolls around most of us are ready for a pick-me-up. Too often these caffeinated drinks are loaded with waist-expanding calories. There’s no good reason to follow up a great workout with a sugar-filled beverage, even if it makes claims for quick recovery and muscle growth. After exercise your body is in need of protein, carbohydrates and potassium, so choose a beverage filled with these three. There are known benefits to drinking alcohol in moderation (one or two drinks per day) such as raised HDL (good) cholesterol, boost in bloodflow, and improved sugar metabolism. A recent study in the journal BMC Public Health reported that people who have a daily drink were 54 percent less likely to be obese. However, it’s called a beer belly for good reason, since many alcoholic beverages are loaded with calories. Recent studies are reporting that most of us drink 21 percent of our daily calories. That adds up to an average of 460 calories each day. It’s easy to see how these calories quickly add up into unwanted pounds. Pay extra attention to what you drink throughout each day. Make it a habit to pass on the calorie-packed drinks and to focus on drinking lots of water. Remember that small changes to your lifestyle over time will make the difference. I’m always available to help – call or reply to this email and I will be happy to serve your needs! Easy Chilled GazpachoGazpacho is a cold tomato-based soup that originated in Spain. What better time to enjoy a chilled bowl of gazpacho than on a hot summer day? Use fresh ingredients for the best possible taste. Posted on October 5, 2010 Categories Fitness, Healthy Living, Lifestyle, Training, Uncategorized, Weight LossTags fit body bootcamp - Rancho Santa Margarita, fitness, health, nutritionLeave a comment on Sip Yourself Thin! You Eat More Than You Think? 1. Drink a large glass of water and eat an apple before going to any party. 2. Concentrate on people, not food. Each day you make well over 200 decisions about food, according to Brian Wansink, PH.D. in his book, Mindless Eating. Your weight is the sum total of your past food decisions. 1. The Meal Stuffer: At mealtime you really stuff yourself. You clean everything off your plate, eat quickly and often go back for seconds. You consider yourself to have a “healthy appetite” and often feel uncomfortably full after eating. Use the Half-Plate Rule: fill half of your plate with vegetables and the other half with protein and starch. Use smaller plates and wait 20 minutes before deciding if you want seconds. Eat slower so your appetite can catch up with what you’ve already eaten. Don’t place serving dishes on the table. Pre-plate your food and then put the rest out of reach. 2. The Snack Grazer: You eat whatever food is within reach, and snack at least three times throughout the day. You can’t walk past a candy dish without dipping in. Your snacking is rarely done out of hunger. 3. The Party Binger: Whenever you attend a social event where the main attraction is food, you eat without stopping. With all the distraction you quickly lose track of how much you’ve consumed and often stop only when it’s time to leave. Stay more than an arm’s length away from the buffet or snack bowls. Put only two food items on your plate during each trip to the table. Make yourself feel full by eating the big healthy stuff first, like broccoli and carrots. Remind yourself why you are at the party: first to socialize or to conduct business and secondarily to eat. 4. The Restaurant Indulger: You eat out at least three times a week and enjoy every minute of it. You love appetizers, large entrees and rich desserts. When you leave the table you are always stuffed. 5. The Desktop (or Dashboard) Diner: You like to multi-task by eating at your desk or on the go. Your lightning-quick meals are grabbed on-the-go from fast food joints, vending machines and convenience stores. You don’t plan your meals ahead of time and end up eating whatever you can quickly find. By making these healthy changes when it comes to your food decisions you will put yourself back on course and moving in the direction of healthy weight loss. Would you like to expedite your fitness and weight loss results? Call or email today to get started on a fitness program that will quickly transform your body. In a medium bowl whisk the egg whites and water. Lightly coat a medium non-stick skillet with non-stick cooking spray and place over medium heat. Add ¼ of the eggs and swirl to evenly coat the bottom of that pan. Cook until the eggs have set, about 2 minutes. Please note that our 9:00 am class has changed to 8:30 am. This is necessary due to summer camp programs running at OC AllStars Cheer & Dance. Take advantage and sign your kids up! Camp at OC is fun!!!! They will have a great time. We will have child care available during the 8:30 am class ONLY! Fees Schedule: $3.00 for the first child, $2.00 for the 2nd child, and $1 for the third child. PLUS 1 WEEK absolutely FREE! Posted on October 5, 2010 October 5, 2010 Categories Fitness, Healthy Living, Lifestyle, Training, Uncategorized, Weight LossTags fit body bootcamp - Rancho Santa Margarita, fitness, health, nutritionLeave a comment on You Eat More Than You Think? So you have a weight problem. Pounds have added up over the years, slowly accumulating on your hips, thighs and belly. When you look in the mirror you don’t like what you see. Yet you feel stuck. You’ve gained too much weight to ever lose it all. You’re too old to make a change. You’d be lost in a gym. You simply don’t know where to start. And so, if you are like most people, you give up on yourself before you ever shed a pound. The enormity of your goal paralyzes your ability to even begin. I believe you can end this cycle of self destruction by simply focusing on the mole hills that make up the mountain – rather than focusing in on the mountain itself. Don’t get me wrong, I know that weight loss can seem like an enormous task – especially when you have 20, 50 or even 100 pounds to lose. However, rather than being discouraged by the mountain of fat you need to lose, conquer the mole hill of losing one single pound each week. In fact, make it your weekly mole hill to drop one pound a week. Doesn’t that sound easy? If you did this consistently for one year you would lose 50 pounds. So how do you shed a pound a week? Simple. Just burn 3500 extra calories. Create a 3500 calorie deficit each week by a combination of increased calorie exertion (exercise) and a decrease in calories consumed (eating less). Take every opportunity to exert more calories by increasing your physical activity and to decrease your calorie consumption by eating fewer calories and by making healthier choices. It helps to record your progress in a notebook and refer back to it. You will be surprised how encouraging it is to see your weekly progress written down on paper. Remember, if you lose 500 calories a day you will drop a pound in a week. Weight loss doesn’t have to be a mountain. Each molehill you conquer will take you one step closer to a healthier, fitter you. Small changes to your lifestyle over time will make the difference. I’m always available to help – call or reply to this email to set up your free consultation. Go through your photo albums and find a picture of yourself in your best shape ever. It may be a photo from your college or even high school days. Now go through your photos and find a picture of yourself in your worst shape ever. You may have to go through old shoe boxes of photos, since this photo may not have made it into your photo albums. Place the two photos side by side. You at your fittest; you at your fattest. Study the photos. Remember what it felt like to be in great shape. Remember what it felt like to be in terrible shape (you may be living that right now). Make a decision. Do you want to continue living your life in bad shape? Or will you shake off past failures and do what it takes to achieve the body you once had? It’s barbeque season, and what better to throw on the grill than a tender fillet of salmon? 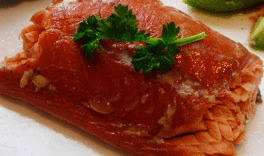 Salmon is full of healthy omega-3 fatty acids and B vitamins. In addition to the health benefits, this salmon recipe packs a sweet and tangy flavor that is sure to please. Nutritional Analysis: One serving equals: 300 calories, 12g fat, 8g carbohydrate, .5g fiber, and 40g protein. Thank you to all boot campers who participated in the 2010 World Famous Camp Pendleton Mud Run! Everyone finished and finished strong. I am proud of each and every one of you and can’t wait to double participation next year! GEAR UP & GET READY! Please note that our 9:00 am class will change to 8:30 am. This is necessary due to summer camp programs running at OC AllStars Cheer & Dance. Take advantage and sign your kids up! Camp at OC is fun!!!! They will have a great time. Posted on October 5, 2010 October 5, 2010 Categories Fitness, Healthy Living, Lifestyle, Training, Weight LossTags fit body bootcamp - Rancho Santa Margarita, fitness, health, nutritionLeave a comment on How do you see it? Why do I work out? That’s easy! 2. It keeps me strong! 3. It protects my body! 5. It’s how we were created! We were not created to sit around watching TV. We were created for ACTION! Take Action now & do something active! Summer has arrived and along with it the dreaded bathing suit season. Whether you can’t wait to bare it all on the beach, or if you’re still working toward a weight loss goal, exercise is the key to looking and feeling great in summer months. More muscle is good for many reasons. You see, muscle requires many more calories each day than fatty tissue. In fact, one pound of muscle burns 30-50 calories each day at rest – compared to a measly 9 calories per pound of fat. “These data suggest that the act of exercising may actually protect the body against the aging process,” said Spector. Regular exercise helps to stabilize blood sugar levels. This is something that people with type 2 diabetes, or at risk for type 2 diabete, gain substantial benefits from. Exercise improves the body’s use of insulin, and the related weight loss improves insulin sensitivity. Of course patients with type 2 diabetes need to get guidelines from their doctor before starting an exercise program. Exercise Increases HDL levels in some people – this means a decrease in your risk for heart disease. Other heart disease risk factors such as weight, diabetes and high blood pressure all show improvement with regular exercise. Most didn’t even realize how bad they felt. It is easy to get used to feeling sluggish, achy and unmotivated. 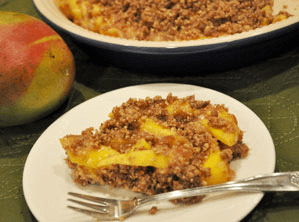 What better way to usher in summer than with this delicious no-bake mango pie? You won’t find any processed sugars or refined carbs in this dessert – just sweet and nutritious whole food ingredients. That being said, remember to use portion control even with nutritious desserts. Combine the pecans, 1/4 teaspoon of the vanilla bean, sea salt and 3/4 cup of the dates in a food processor and blend. Press half of the mixture into the bottom of a pie pan, set aside. Combine the remaining 3/4 cup dates, 1/4 teaspoon vanilla bean and water in a food processor or blender. Mix until a thick syrup forms. Place the mangoes in a large mixing bowl. Toss with the syrup until fully combined. Arrange the mangoes over the crust, then sprinkle with the remaining crust. Keep in the fridge and eat within 2 days. Nutritional Analysis: One serving equals: 220 calories, 12g fat, 27g carbohydrate, 5g fiber, and 3g protein. Posted on October 5, 2010 Categories FitnessLeave a comment on What is your Reason?! Never Cheat on Your Diet Again! I urge you to find your passion! Well, I set out to figure out what my passion was. It took many years, but today I am so full of joy because I know that my work in health and fitness is God’s purpose for me in this life. It’s not an easy job, but it is the best job, and I am so fulfilled because of it and because I have the very best bootcampers. I want to thank all of you, personally, for allowing me to pursue this passion. Why Does Temptation Always Win? Posted on October 5, 2010 Categories Fitness, Healthy Living, Lifestyle, Training, Weight LossTags fit body bootcamp - Rancho Santa Margarita, fitness, health, nutritionLeave a comment on Never Cheat on Your Diet Again! Will Your Vacation Make You Fat? Between missed workouts, extra large restaurant meals and indulgent snacks, lazy vacation days will quickly add inches to your waistline. So before you pack your bags for your next adventure, read the following 6 Vacation Tips and come home fitter, not fatter. Visualize what it would be like to return home fitter than when you left. Take a moment to let yourself feel the excitement that you’d experience. Remember what accomplishing your goal feels like – this will keep you motivated throughout your trip and will help pull you through the inevitable tempting situations that you’ll face. It’s easy to spend vacation days sprawled out by the pool, but the inactivity will quickly add up to extra pounds. Always take the stairs rather than the elevator. Talk about bonus calorie burning! Go on a jog in the mornings before your daily activities, or jog in the evening after the day winds down. If your hotel has a pool, swim a few laps each day. Swimming is a fun way to get in a full body workout. If your trip takes you to a place of natural beauty then go on a hike. Even while hiking at a slow or moderate pace you’ll burn plenty of calories. Play some sports – beach volleyball, a game of hoops, Frisbee, or bike riding are all great ways to have fun while keeping fit. One of your biggest enemies when it comes to vacation weight gain is…sugar. The average modern person consumes 46 teaspoons of sugar every day. The average person on vacation consumes even more than that. Sugar creates false hunger (as a result of the insulin rush and then ensuing plummet in blood sugar levels), which causes you overeat. Sugar promotes aging (due to the advanced glycation end products, or AGEs, that occur when insulin levels are consistently elevated as a result of eating too much sugar). Sugar has even been dubbed the negative fountain of youth! Sugar weakens your bones -making you vulnerable for osteoporosis, and weakens your teeth – making you vulnerable for cavities (both due to the calcium being pulled from your bones and teeth in order for your body to process sugar). Sugar in excess is stored as fat (after your liver has no more room to store it, sugar is converted to fat and deposited on your belly, thighs, hips and the backs of your arms). So instead of eating that ice cream cone or chocolate éclair, satiate your sweet tooth with a piece of juicy fruit. While fast food restaurants are definitely convenient, with their low prices and quick service, it’s really not worth the additional pounds brought on by chips and fries. As you enjoy your vacation keep this in mind: don’t eat fried foods. While this is always a good plan to follow, it is even more important to abide by while traveling. A gram of fat contains 9 calories as compared to the 4 calories that proteins and carbohydrates carry – so you can see that consuming fried foods will drastically increase your caloric intake. Take an average potato, bake it and you have 110 calories and 0 grams of fat. Take that same potato, turn it into French fries and you have 380 calories and 18 grams of fat. Frying food is the easiest way to dramatically increase the calorie and fat content. And you know that extra calories and fat end up as extra body fat. If I still haven’t convinced you to pass on the curly fries, keep in mind that heartburn and indigestion are not fun…especially while on vacation. Need I say more? Body Weight Squats: Stand with your feet shoulder width apart. Lower down into a squat position. Make sure that your knees do not go past 90 degrees. Exhale as you straighten your legs and return to the starting position. Complete 12-15 repetitions. Do Jumping Jacks, High knees, or jog in place for 30 seconds. Body Weight Lunges: Stand with your feet shoulder width apart. Exhale as you lunge forward with your right leg. Make sure that your knee does not go past 90 degrees. Inhale as you return to the starting position and repeat on the other side. Complete 12-15 repetitions. Push Ups: Get into the push up position (depending on your fitness level choose to go off your knees, push off of the wall, or assume the traditional position). Inhale as you lower your chest down. Exhale as you return to the starting position. Complete 12-15 repetitions. V-Ups: Sit on the edge of a chair or bed and lean back. Exhale as you drive your knees in toward your chest, squeezing your abdominal muscles. Inhale as you lower your knees back down with control. Complete 15-20 repetitions. Well, now you have 6 tips that will keep away the unwanted vacation pounds. You may even end up losing a pound or two while away. But let’s be honest, you want to lose more than a pound or two. You want to lose all of those extra pounds. You may feel that the secret to achieving weight loss is just that – a secret. A mystery. You try, and try, and try but your goals are never met. Your dream body continues to stay out of reach. In my experience the people who are unable to lose weight aren’t failing due to laziness. In fact, those frustrated with their weight often put in a lot of effort – but on the wrong things. A fad diet. The latest exercise gizmo. An ineffective routine at the gym. It’s not that you aren’t willing to put in the effort – you’re just doing the wrong thing. Think about this for a moment…What if this was the summer that you took control of your body? The summer that you threw your fat clothes away…the summer that you were proud to put on a bathing suit…the summer that your doctor congratulated you on your improved health…the summer that your family and friends – and that special someone – showered you with compliments. It’s possible. Even more possible than you think. The thing is that you need to direct your effort in an effective way. You see, for me weight loss isn’t a mystery. It’s my passion. 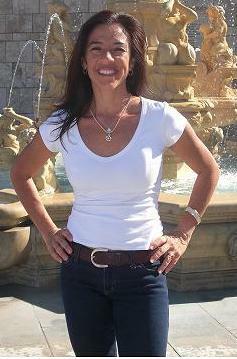 I have a proven method that will dramatically transform your body into one that you are proud to be seen in. However, I can’t promise that it will be easy. You’ll work hard, you’ll sweat and you’ll even feel sore. And before you know it you will be telling everyone you know about the amazing results you’ve achieved. So as you plan your next vacation, why don’t you also give yourself the gift that you really want – a new body. A tighter body. A stronger body. A healthier body. I am here to help you do just that. Call or email now to schedule your first body-transforming workout. Travel days create the perfect opportunity for snacking. A mocha and scone before your flight, a salty snack on the plane and then before you know it – it’s lunch time! Road trips open up even more opportunities for regrettable snacking…rest stop vending machines, gas station quickie marts and of course the never ending string of fast food restaurants that line the highway. Also remember to drink plenty of water throughout the day. It’s easy to become dehydrated while traveling, so always carry a water bottle with you. Baked beans are filled with healthy protein and fiber. 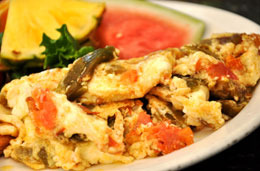 This homemade recipe is quick and easy to make and tastes great. Serve it hot from the oven, or enjoy it chilled – either way it’s a crowd pleaser. Preheat oven to 350 degrees. Spray a large baking pan with non-stick spray and set aside. In a large skillet, heat the olive oil and sauté the garlic and onions until tender. In a large bowl, mix the tomato paste, tamari, maple syrup and mustard until a thick sauce forms. Add the beans and onions and mix until fully incorporated. Spread the beans into prepared pan, cover tightly with foil and bake for 30 minutes. Nutritional Analysis: One serving equals: 134 calories, .5g fat, 25g carbohydrate, 5g fiber, and 8g protein. Posted on October 5, 2010 October 5, 2010 Categories Fitness, Lifestyle, Training, Weight LossTags fit body bootcamp - Rancho Santa Margarita, fitness, health, nutritionLeave a comment on Will Your Vacation Make You Fat?